This living room refresh has a modern, but French farmhouse vibe that’s cozy and inviting. 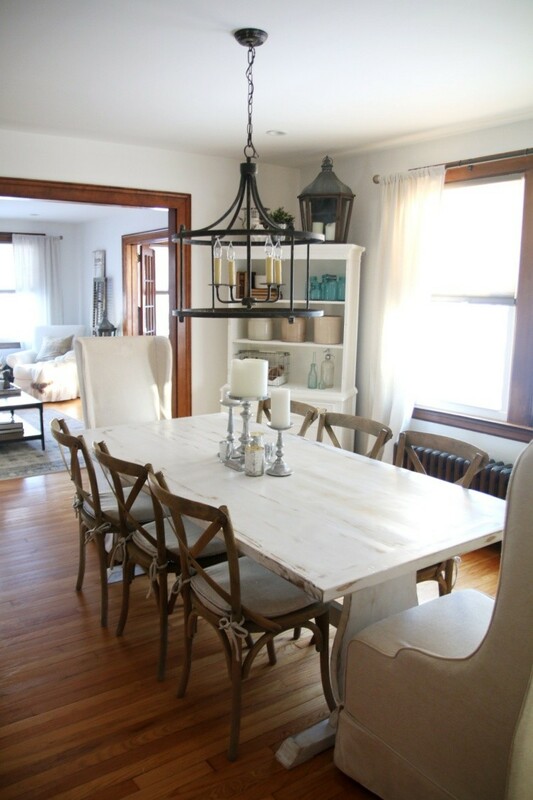 Sandra Downie of The Rustic Life used a mixture of modern and vintage pieces to make the space come together. 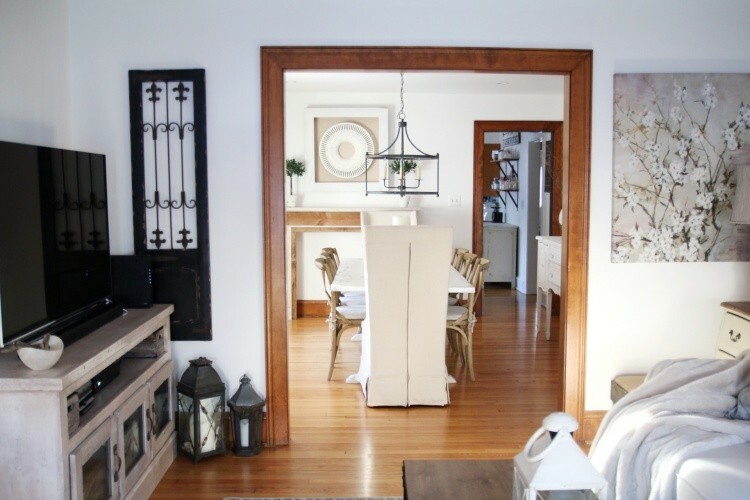 Read on to see how Sandra balanced the look with her modern farmhouse gallery wall. Hi loves, as I’ve shared with you a few times already this year over on my Instagram page, simplifying my decor is a priority for me in 2018. I stepped back late last year and decided what goals I wanted to achieve in regards to how I lived. From my health and wellness to how I decorated my home. The wall behind my sofa in the living room has always felt incomplete to me. I had a very pretty shelf up there that I really loved, but it didn’t feel like a cohesive space. Once I redecorated my sunroom in a modern farmhouse style, I fell in love with the modern vibe that black added to the room. That’s when, deep down, I knew simplifying and modernizing my home a bit more was something I wanted to take baby steps towards. I turned to The Home Depot and set out to start making steps towards those goals. If you are choosing to design a modern farmhouse gallery wall, there are some things you will want to incorporate to pull this look together the way I did. Adding the color black to any home instantly adds a modern feel to a space. I chose to add black in the form of framed art. 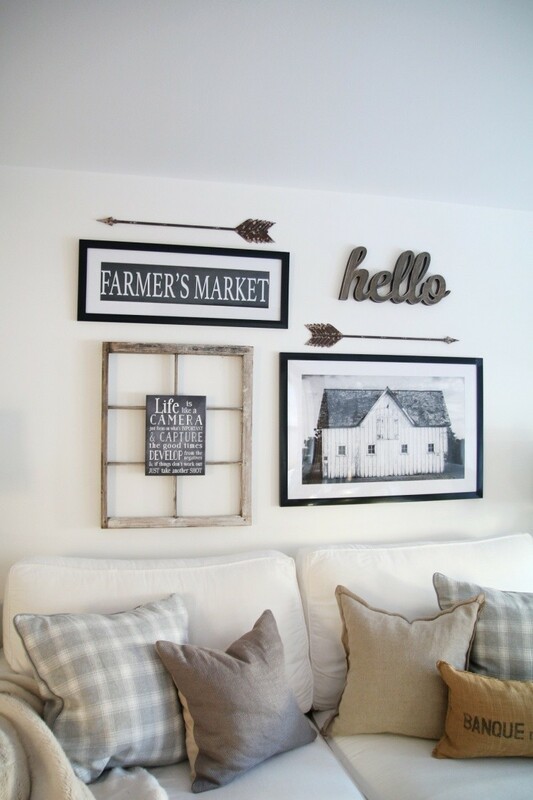 What I love most about these framed pieces of wall art: although they are modern, the print themselves say farmhouse. 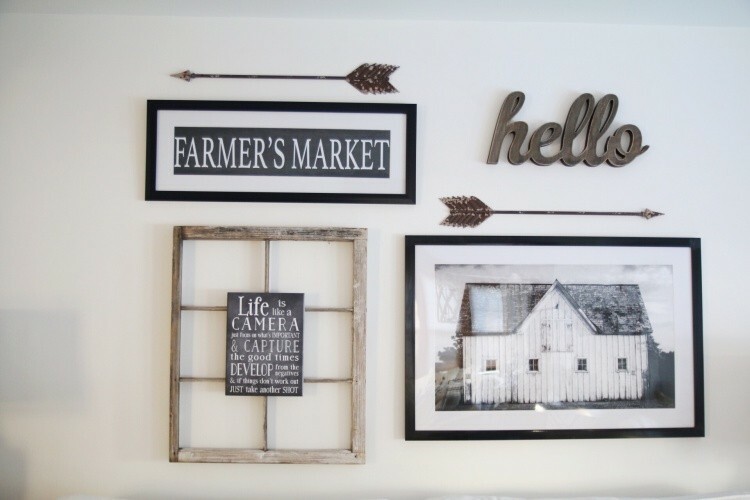 The Farmer’s Market printed wall art is simple and elegant. 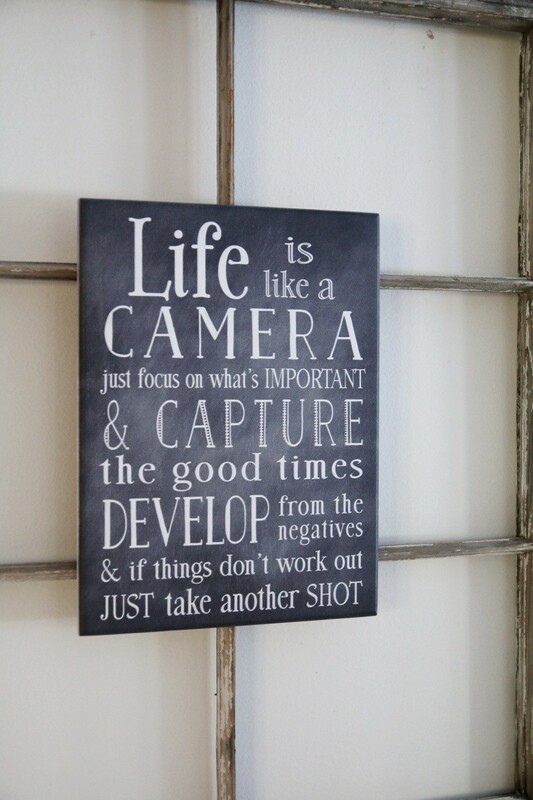 The photo of the Grange Blanche barn wall art takes you back to the farm and visions of a more relaxed farmhouse life. Because there was so much black on the farmhouse gallery wall, I also wanted to add more black into the dining room. 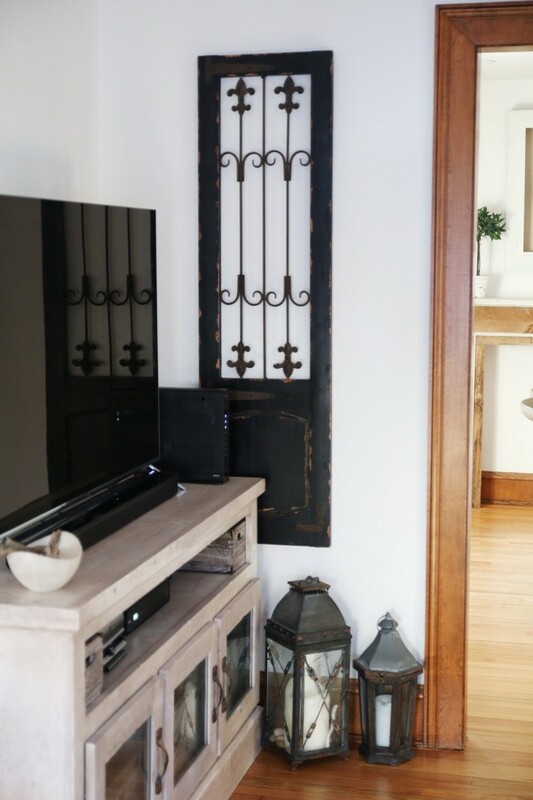 I brought in this black gate wall art door. Not only does it incorporate black, I love the french country look of the door as well. It fits beautifully with some of the French inspired decor I already have. It was the perfect compliment to the empty wall next to the TV. I accomplished this with the metal arrows wall sculptures. I love that they are lightweight but they add visual appeal, texture and warm tones to the space without being over powering. Something you would perhaps pull out of a barn or an old farmhouse. What I added to the wall was an old window frame that I had, but used in another way. I re-purposed it to fill the space with a larger sized item but also thought it would make a nice layering piece with the Life is Like a Camera wall art. I like how it feels like the art is floating on the window, adding visual interest. The selection of art wall decor that The Home Depot stocks is very impressive. It was really hard choosing exactly what to pick, but I must say there is something for every style and every budget. 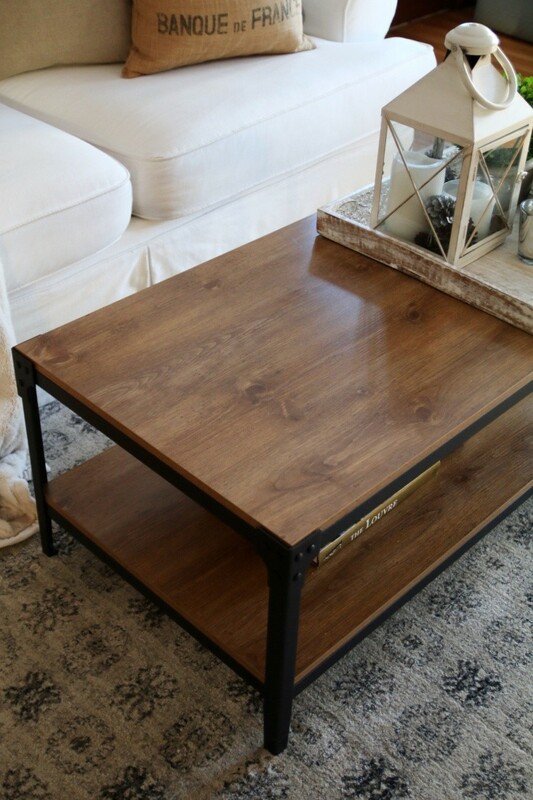 Since I was making small updates to add a more modern feel to our home, I swapped out the ottoman for this refined rustic angle iron barnwood storage coffee table. I love the color and grain of the wood and the simple clean lines of the frame. The black metal frame is very sturdy (trust me, my hubby stood on it to hang the chandelier and he is 6 ft. 5 in.). The quality and finish on both the wood and metal is beautiful and elegant. The photos don’t give it justice. 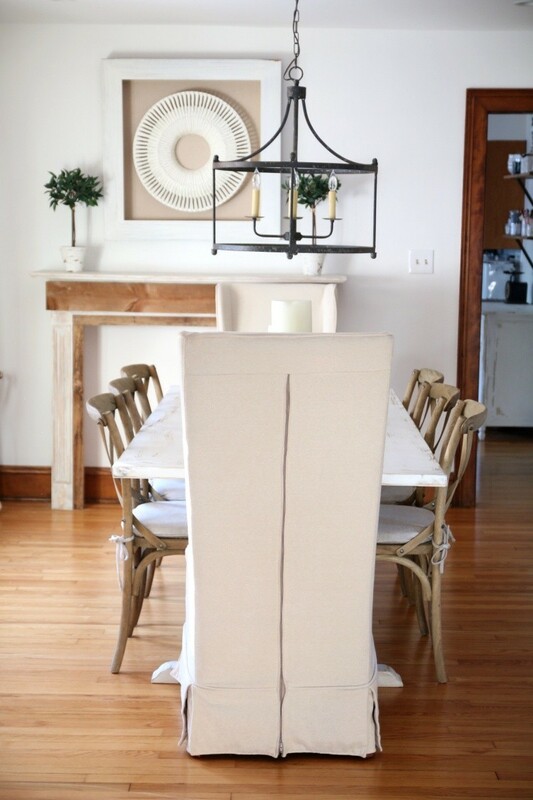 To add more modern elements to the dining room, I added two bacall natural cream cotton blend high back dining chairs to both ends of the table. Before, there was one chair on one side on the dining table which left the room feeling unbalanced to me. 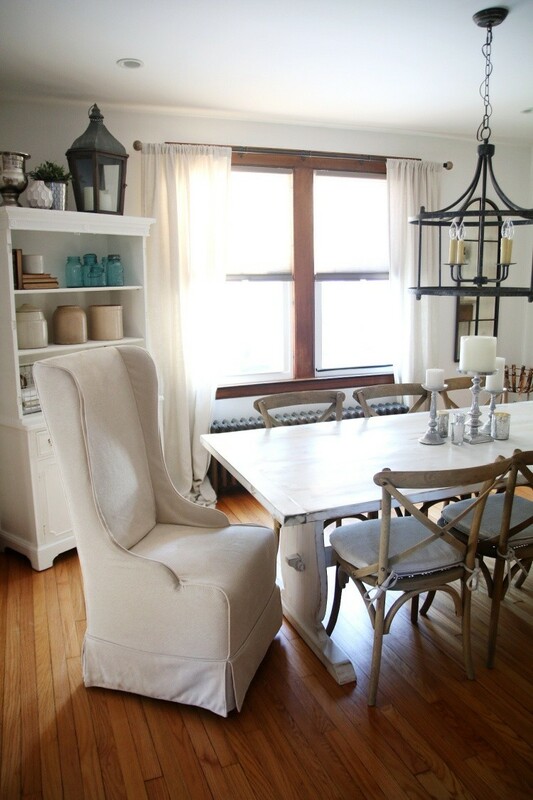 By adding these chairs with clean lines to my farmhouse table, a modern farmhouse look was instantly achieved. What I love best about my new chairs is the quality and softness of the cotton fabric and that the fabric is removal in case you have to clean it. The chair is well built and comes assembled in one piece. You will find these to be a classic and timeless addition to your home that can be enjoyed for years to come. My home has typically been decorated in a French farmhouse style. But, I really love the way adding the farmhouse gallery wall and other modern pieces from The Home Depot have created a modern farmhouse feel to my home easily and affordably. Find decor pieces from The Home Depot to create your own farmhouse gallery wall and living room. 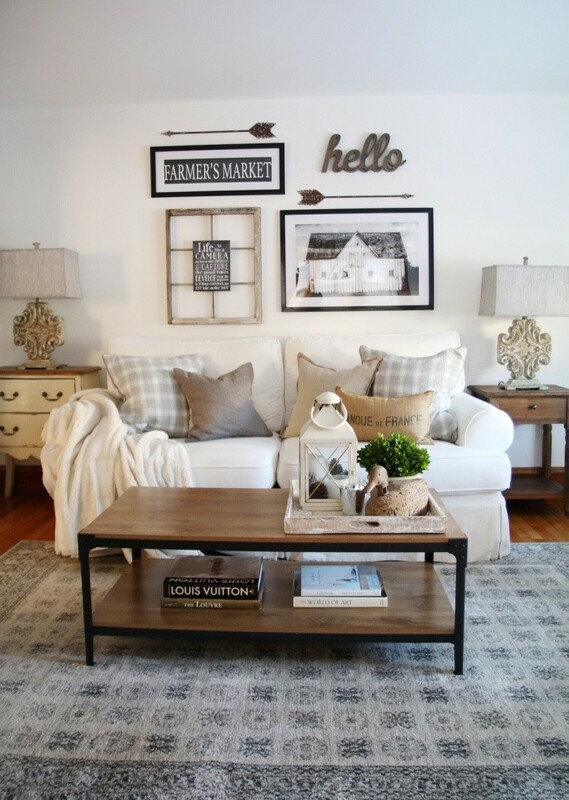 Find more inspiration for your farmhouse living room on The Home Depot Blog. Follow our Living Room Ideas board on Pinterest for more inspiration. The post How to Design a Modern Farmhouse Gallery Wall and Living Room appeared first on The Home Depot Blog.